Every February, Highland Park Senior High Thespian Society has a winter production called the One Acts. The One Acts are 10 to 30 minute performances that are picked and directed by students. Although the One Acts are an annual event, there are two things that set this year apart from all the previous years. One way is that this year’s One Acts are different than past years is that the Thespian Society decided to open the opportunity for any grade to direct. In past years only Seniors had the opportunity to direct, but due to lack of students interested in directing, the option opened up to all high school students. The directors of the One Acts this year were Sophomore Zoë Challenger, Junior Schyler Fish, and Senior Max Muter. Zoë directed Variations on the Death of Trotsky and First. Schyler directed 13 Ways to Screw Up A Collage Interview and Sure Thing. Max directed The Philadelphia and The Chicken and The Egg. The end products of each of these performances were amazing. Zoë Challenger’s performance First was an extra special production in that she had written it herself. First tells the story of a twelve year old who is excited to turn 12, leave adolescence and experience “firsts.” The girl’s sixteen year old brother and his friends share their “firsts” experiencing everything from sexuality, feminism, mental illness, being a person of color, and coming of age. First isn’t just powerful in its context and performance, but also the story behind it. Zoë submitted her play and Director of the Thespian Society Steven Houtz approved it. Although the One Acts are “very stressful to direct and manage,” Zoë along with all other directors were very happy and proud of the end result, so in the end it was worth it. 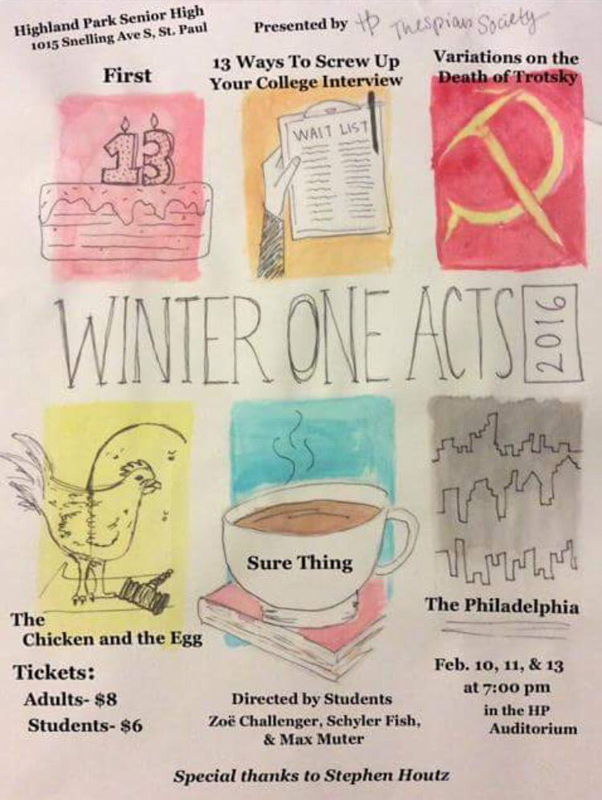 Be sure to see the One Acts next winter!